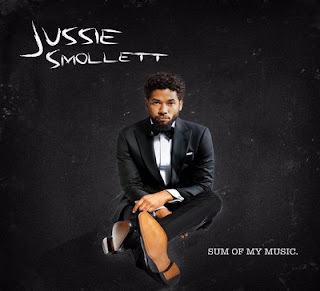 Singer-songwriter-actor-director-producer-activist Jussie Smollett announces the release of his debut full-length studio album "Sum Of My Music" on March 2. An offering from his own Music Of Sound company, it also marks his debut as an independent artist and executive producer. Steeped in soulful R&B, pop and hip-hop, and seasoned beautifully with Jussie's soaring vocals, "Sum Of My Music" represents a body of work he has been preparing for his entire life. Known around the world as one of the stars of the television cultural phenomenon "Empire" for his role as the tortured son, Jamal Lyon, a singer muddled in and by his family's drama surrounding their music empire, Jussie Smollett quite literally took every moment away from the set and his many acting roles to concentrate on his first love; music. He said that no matter what he was doing, he was drawn to make music and to make it his way and on his terms. "Music has always been my heart. Something I can always and will always create," Smollett said. "When I was working day jobs in offices, as a waiter, in retail or even as a clown at children's parties, music was the thing that I could always do at night, on weekends, in the morning time; I could create music around anything I was doing. There's never an excuse to not create." Fans have been privy to what Jussie can do musically when the Empire soundtrack, for which Smollett was both a writer and vocalist, went to number one on the Billboard charts, was nominated for a Grammy, Billboard and American Music Award. He combined musicality with activism on March 17, 2017 with the release of "F.U.W." (F** Up World), a smoldering song and visual that took a hard stand against the current administration's policies by highlighting injustices around racial prejudice and the fight for religious, human and LGBTQ rights. Fans and critics were moved by the song and the video's honest depiction of a society gone awry, and dutifully impressed with his role as director, which he has now taken to the set of "Empire." It was a glance into what was to come musically from Jussie Smollett; to make music that stir, provoke and move audiences. It was time to get to work in earnest on "Sum Of My Music." The first music from the upcoming album was released this January, the song "Freedom." The accompanying video is a beautiful visual that is an unapologetic celebration of love. Smollett said, "I wanted to show love in its most honest and pure form. A couple doing what every couple does…just living their lives. It's a song about complete bliss, not the fantasy or some false sense of security, but love in its most honest and pure form. Whether it's love for your partner, your family, your people or yourself, when Love is true, there's a feeling that you can literally fly. That's what I want for myself and every creature on this planet. To me that's true Freedom." The video stars award winning actress Tika Sumpter (Southside With You, Ride Along) and Tony and Grammy award winner, Cynthia Erivo (The Color Purple). Most recently, Smollett released "Catch Your Eye" featuring Swizz Beatz. Fader Magazine declared the music video for "Catch Your Eye," as "mesmerizing." In the neon-lit backdrop, covered in paintings from artists all over the world, including Nigerian visual artist Laolu Senbanjo and acclaimed Opera singer, Lauren Michelle, Jussie makes an impassioned appeal in this head bop tune. "To have one of the true Kings of Hip Hop like Swizz leading this with me is just bananas," Smollett said. With the visual, I wanted to take it even further. I was inspired by Hype Williams' film BELLY and really just Hype in general. But I also wouldn't be me if there wasn't some stream of consciousness in there." In mid-March the third single and visual, "Hurt People," will be released. Filmed entirely on location in South Africa, the video pays homage to all that is beautiful and historic about Mama Africa. Inspired by the late Nelson Mandela, the video was filmed with an all-black South African labor force, including cast, crew and fashion designers, to live the reality of Africa Rising. For Jussie Smollett it is matching his heart with his music to produce a body of work that is unmistakably him. "I'm releasing just a piece of who I am with this project and I just want people to hear it, feel it and vibe with it. All I want them to feel is the love put into this. Anything else is just gravy," Smollett said.